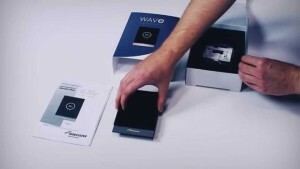 A Worcester Wave is a smart thermostat that connects to your entire house and your home internet connection. It controls both the central heating and the hot water and the internet connectivity means it can do a lot more than a simple thermostat, so be sure to play around with it to see what it can do. Before you do that though you need to install it. Installing the Worcester Wave is a simple process and here’s what you need to do. Before beginning the installation make sure that your Worcester boiler is compatible with the Wave. The Worcester Wave website has a list of all compatible devices, and you’ll definitely need a 2-wire EMS BUS connection between the boiler and Worcester Wave, and an internet connection if you plan on using the WiFi capabilities. Now you need to choose a location to put the thermostat, to be known as the reference room. It can be a hallway or landing too and you need to make sure there’s plenty of room around the thermostat to make sure that nothing affects it. Find where you think it would be best to place the thermostat and prepare to attach it to the boiler. Keep in mind it can only be connected using the EMS BUS connection on the boiler and you should never use the boilers 230 volt connection or the external 230 volt supply. Connecting the boiler and the thermostat is as easy as just connecting the two points. It’s now time to install the wall mount plate ready to install your thermostat properly. A good place to put the plate if you’re replacing your thermostat is the place where that thermostat was. Keep in mind this is where you will be installing the thermostat so where you decided to put it earlier will also do. You may have even chosen that spot earlier. Simply attach it to the wall using any basic tools. When the wall mount plate is on the wall it’s time to connect the thermostat cable, which is the EMS BUS cable of the boiler, to the cable clamps on the wall plate. If you’re putting the thermostat in a junction box you may need to insulate the box first to make sure the thermostat tracks accurate temperatures. When everything is connected the last step is fitting the junction box. You have to hook the thermostat to the back of the wall plate. Then press the bottom of the thermostat against the wall plate. You’ll eventually hear a click as the thermostat pops in to place and locks. When the time comes to remove the thermostat that’s just as easy. The thermostat has an unlock button under the front edge. When you press that down it unclips and it’s easy to tilt the bottom of it until it comes off. When you’ve attached the thermostat properly according to the instructions above it’s time to use it for the first time.